MUFF WIGGLER :: View topic - pure ambient synth music recommendations? pure ambient synth music recommendations? I don't really know much about him, other than he uses Serge gear. I discovered his music about 10yrs ago now through CDBABY, and it has since played a huge role in my life (including being played throughout my sons home birth!). Highly recommended and highly under-appreciated! its centered around 70s "space" music which i find quite boring but it covers a lot of fairly unknown composers and diy synth freaks that have been doing their thing in basements and attics since those times ... which i find quite interesting. check out this home made modular by german composer rüdiger lorenz with 27 oscillators! anybody knows any blogs about contemporary synth music? 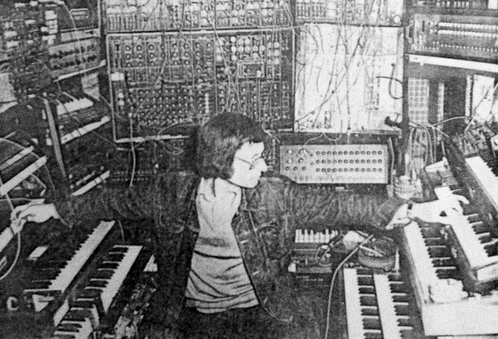 this is where kosmische space music all started: "klaus schulze - der lauf der dinge" from 1975. this is right after he bought his first big moog modular and was figuring out the secrets of linear sequencing. majestically brilliant, this goes in front of the list. its not easy to replicate this sound with my moslab 16, these seem to be the ingredients: oscillators with "floating" tuning, drifting sequencer clocks, tape delay, multitrack tape master or recorded in one go? reverb in 1975? See, I get confused when people throw around the "ambient" term (I know...that's a bit ironic coming from guy who calls himself emdot_"ambient" right?) because back in the '70s the term didn't exist as a genre. Neither did New Age. Berlin School, I'm not even sure when I heard that used first...but when I did it was to distinguish between the non-beat oriented synth music of Schulze and TD, and the electro-beat music of Kraftwerk. And where I agree with you that in general "ambient" has been restricted mainly to 1) sequence driven works like the Schulze example you've posted, 2) unchallenging pad-drenched New Age treacle, and 3) delay/reverb one-chord drones...I do believe it can be applied to a wider range of works. And then, much simpler, small musical statements like these short mood poems: Tempera Loop, and Spectralisis II. I think the ambient genre has been flooded with works made specifically to fit a cliche template, and that far too many musicians are trying to fit into a mold rather than create something personal. i like the organ piece, its sort of the ultimate noodling session, reminds me of terry riley playing "shri camel" on a yamaha yc-45 modded for just intonation. i have the exact same organ, its such an amazing instrument. analog organs are much overlooked synth instruments. i especially prefer the combo organs to the hammonds. btw what are the mysterious boxes sitting on top of the organ? pitch shifter? "Throughout the 1970s, legendary American composer TERRY RILEY toured regularly in Europe, performing solo organ concerts. 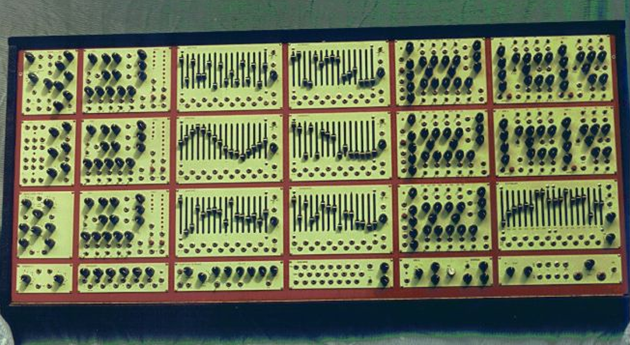 In October 1978, Rileys personal technician CHESTER WOOD built a stereo digital delay out of an ancient computer he had procured from DON BUCHLA, and the subsequent tour was the maiden voyage to try it out. Rileys specially modified two-manual Yamaha YC-45D portable combo organ had a Just Intonation setting and allowed him to feed stereo signals to the digital delay. The Yamaha had been manufactured with single mono output, but now with the modification it had a separate output for each manual eventuating in four channels (two live and two delayed). During a residency as a Fellow at DAAD in Berlin, Riley fine-tuned the delay speeds and experimented with different stereo combinations so that by the time of this Paris concert, the tape delays worked well with the tempos he was using. This all came on the heels of the Shri Camel recording Riley had just made in San Francisco for CBS. The musical materials of The Last Camel in Paris are second generational, belonging to the Shri Camel family while manifesting their own distinct shape and flavor. Includes never-before seen archival photographs." - Elision Fields. Terry Riley should be towards the top of the list even though he would not refer to his music as ambient or new age. Most of the music posted so far is either directly or indirectly derived from his oeuvre and his from La Monte Young. Those boxes atop his organ are referred to literally in the flip side of Rainbow In Curved Air, that being Poppy's Nogood Phantom Band in which he plays soprano sax through one. I have the Rudiger Lorenz LP 'Southland' and it is really good for a homebrew style recording in the 80's. 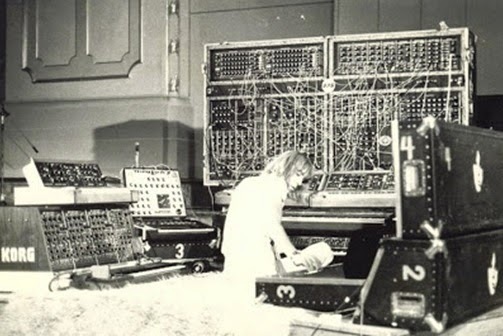 It has his massive modular, Roland Vocoder and drums, another couple of strings synths and maybe a mono or two. They are listed on the jacket. The one to the right looks like an old Marantz amp. "Ambient" music came about when Brian Eno first used this term in the context of "Discreet Music". I wouldn't call sequencer-based stuff necessarily "ambient", it's "Berlin School" (or "Bielefeld School", for that matter...), even though you might call "Atem", "Zeit", or "Mirage" proto-ambient. Funnily enough, this type of heavily sedated techno from the 1990s (FSOL, The Orb, BOC) was also called "ambient" although, to me, it had nothing to do with "ambient" in its original sense. I'm sure some of Riley rubbed off on me. I'm a huge fan of his organ works, and Shri Camel is sacred music to me. I used it in '82 as the soundtrack to my one and only one-man art show at the gallery opening. And I agree with you on organs: combos over Hammonds. Used to quite like the Korg organs back in the early '80s. The organ on Voices of Ether were actually NI's B3 or B4 softsynth using either its Vox Continental or Farfisa sound engine. I don't remember which right now. Someone mentioned Hiroshi Yoshimura -- highly recommended if one wants to stick to the Eno concept... furniture music, sonic perfume etc. Although this is getting off the topic, there are many Japanese projects in the 1980s that explore musics are highly essential and yet without any parallel in the US or Europe at the time. Often the spirit, if not the participation, of Hosono is somehow involved. Besides Yoshimura (a very minimalistic outlier), there is Midori Takada, World Standard (Soichiro Suzuki), Inoyama Land, Hosono's own "SFX" project. Different reconfigurations of minimal, folk, world music with early digital synthesis and sampling technologies. im really into pure beatless synth music at the moment. not the new age kind but actually composed. here are some gems ive discovered but feel free to recommend more. Thomas koner and Nicholas Szczepanik are two I would add to the drone camp. Love the stuff by vlasdislav delay as well as mentioned by op. Thomas Köner is not synthesis ambient. It's mostly made of processed gongs, found sounds and field recordings. The finest ambient composer IMHO. Moby put out a free ambient album last year. It's really good. All mellow synth stuff. Arecibo Plutonian Transmissions is an amazing piece of music from 1994. Its concept is quite enthralling. I listen to it over and over. Lustmord's dark ambient is pretty amazing. He basically defined the genre.